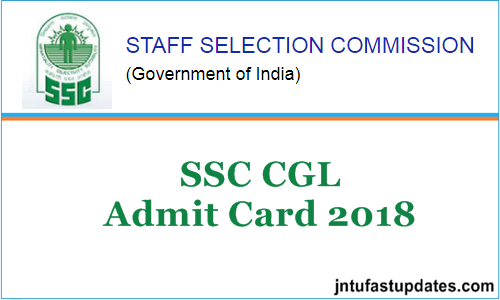 SSC CGL Tier 1 Admit Card 2018-2019 : Staff Selection Commission (SSC) is going to conduct the Combined Graduate Level (CGL) written test shortly. The SSC has initially scheduled the Tier I examination from 4th June to 19th June 2019. But the SSC CGL Tier 1 examination was postponed to a further date. the Staff Selection Commission announced the revised dates. An immense number of applicants have shown their interest in SSC CGL posts and applied in lakhs. So, the competition is going to be tougher this year. Hopefuls applied for SSC CGL posts can appear for the tier 1 examination as per the schedule. But, before that candidates must have to download SSC CGL Tier 1 hall ticket/admit card to appear for the test. Applicants can get their hall ticket from the SSC official portal, ssc.nic.in and can keep it safe to carry it to the examination. The examination officers won’t let the applicants without showing the hall tickets. Hence all the hopefuls must keep in mind of this instruction and carry the admit cards as a must. Staff Selection Commission (SSC) is the national level organization that releases various recruitment notifications annually. The SSC has recently rolled out the Combined Graduate Level (CGL) notification for various posts. The announced posts are Junior Hindi Translators and Constable posts in CAPF, CISF and Delhi Police. Many of the aspirants have applied for the SSC CGL Tier 1 posts. The selection of aspirants will be done through the tier 1, tier 2 examinations and interview rounds. Candidates have to qualify all the rounds to shortlist for the SSC CGL posts. Hopefuls seeking to get central government jobs have applied till 4th June. Lakhs of aspirants have applied for the SSC CGL posts this year. The Staff Selection Commission has announced that the Tier 1 examination will be held from 25th July to 20th August and the Tier 2 examination will be held from 18th January to 20th January 2019. While the SSC Tier I examination was postponed further. Aspirants applied for SSC CGL posts can check the details from the official portal, ssc.nic.in. The SSC CGL Tier 1 examination reginal-wise will be held at MP Sub-Region, KKR region, North Western Sub-Region, Central Region, Eastern Region, North Eastern Region, Southern Region, North Region and Western Region. Applicants who are going to attend the Tier 1 examination from all these regions can download the tier 1 hall ticket soon from the SSC postal, ssc.nic.in. The Hall ticket/Admit Card link will be activated 10 days before the examination dates (approximately). Hence the applicants can stay checking the portal on regular basis to check the details. Contenders applied for the SSC CGL posts can download SSC CGL Tier 1 hall ticket from the official website, ssc.nic.in. Also, Applicants can even download their hall tickets from the SSC regional websites. Applicants have to take a printout of the hall ticket after downloading it. Along with the hall ticket candidates also need to carry any valid identity proof for verification purpose. On the SSC CGL Tier 1 hall ticket, candidates can check the details of their examination venue, date, timings. Candidate’s name, register number, photograph, signature, father’s name, DOB and other details will be printed on admit cards. Check all the details clearly once and take a printout of the admit card. SSC CGL Tier I examination will be held in Online format. Overall 4 sections will be there in SSC CGL Tier 1 examination. Overall there will be 100 questions and the examination will be held for 200 marks, that is each question carries 2 marks. Tier 1, and Tier 2 examinations will be held online and the tier 3 examination will be held descriptive type. It contains the Essay, Letter writing, applications, and precis and others. DEST/CPT rounds will be held in Tier 4. How to download SSC CGL Admit Card for Tier 1 Written Test 2019 Online For All Regions? SSC CGL Tier I Admit Card 2019 appears on the screen. Check it once and take a printout for future purpose.